This is a weekly series that aims to preview upcoming Regional tournaments, review Regional tournaments that have just taken place, highlight winning decks, interview players, and more. Last week's article was The Road to Worlds 2013, Week 5. Tara's Place: The results for this tournament have yet to be entered. If and when they are, a review will added at a later date. Arby's Restaurant: The home of the first ever Tribbles Regional saw eight players participate for the title of Risa Regional Champion. Thomas Vineberg (Exon) dominated the tournament, scoring 631,123 Tribbles - more than half the total Tribbles scored by all eight players combined. No tournament reports have been written yet, but (based on the scores) we can assume that Thomas went out in two or three of the five rounds. JD_Ashley (Holodeckplate_Leader), playing a Poison deck titled "JD Poison Deck", took second place with 234,264 Tribbles; and Dan Hamman (SirDan), playing a Go deck titled "Generic Tribbles", was third with 213,203 Tribbles. The remaining five players only managed to score 42,353 Tribbles between them. The less written about them, the better. Especially considering that two of the three predictions to win filled those five places. Four deck lists can be found on the tournament results page. R.H. Stafford Library: The inaugural First Edition Regional to be held in Minnesota in the Continuing Committee-era attracted eight players. Competition must have been fierce, as not one player remained undefeated over the four rounds. Three players ended the day with just one loss. Kris Sonsteby (LORE), playing a borrowed Klingon deck titled "I'm Like a Runaway... A Heart Without A Home" took first place just ahead of Matthew Hayes (karonofborg13), playing a Hirogen deck titled "In the beginning, He created the fish and then the Hirogen. And so shall the Fish guide us to our Prey! ", thanks to their round three game finishing 100-45 in Kris' favor. The third player with just one loss; Dan Van Kampen (Iron Prime), playing a Borg deck titled "The Best of Both Worlds"; finished in fourth place having recorded a modified result in all four of his games. Other affiliations played include Cardassian/Federation, Federation (twice), Ferengi and Romulan. All eight deck lists and six tournament reports can be found on the tournament results page, and an interview with Kris Sonsteby is below. Amazing Fantasy Comics 3: Ten players turned out for this Second Edition Sector 001 Regional. At least three Original Series decks were being played, and two of them were battling. Brian Sykes (Armus), whose deck was titled "Boom or Bust", only lost one game and finished in third place; while George Meadows (theECH), playing a deck titled "Stacey" lost two games and took fourth place. That's not bad considering that they played four of the same opponents over the five round tournament. George played their shared opponents first in three of those four games, so Bryan's results are even more exceptional given that his opponents had had very recent experience playing against a similar deck to his. The only two players to beat either Bryan or George finished above them in the top two spots. Steve C (Kor), playing a Klingon deck titled "I feel an enormous amount of pressure to get this right. I want to win that car! "; faced Lucas Thompson (edgeofhearing), playing a Cardassian deck titled "Only On Account of Villainy"; in the final round to determine who would win the tournament. Steve won the game 100-65 to take his first Regional title in the Continuing Committee-era. Other decks played include Dominion, Relativity and Next Generation. Six deck lists and two tournament reports can be found on the tournament results page. Good Games St James: Four players participated in this delayed First Edition Deep Space Station K-7 Regional. The first round saw an upset, with three-time past winner of this Regional; Matthew Townsend (thac0276), playing a Cardassian deck; losing to Matthyas Kiraly (stoovie), playing a Klingon deck titled "I Wish I Could Play 1e More Often... *sadface*". Matthew was then beaten by Robert Dawson (TBT), playing a Federation deck titled "A new deck? Ain't Nobody Got time For That", in the second round and his chances of a fourth successive title went up in smoke. The deciding game happened in round three, when Matthyas and Robert faced each other. Robert won that game to take the title - his first First Edition title in the Continuing Committee-era. Congratulations Robert! Other affiliations played include Ferengi / Romulan. Three deck lists can be found on the tournament results page. This week, Kris Sonsteby (LORE) only had one prediction to make, so I thought I'd give him more work by interviewing him. Renowned as a Second Edition player, Kris takes his seat in the interview chair because of his First Edition win at the Andoria Regional in Minnesota. James: Congratulations on your win, Kris. Kris: Thanks, James. Before we go any further I just want to say that out of the now four interviews we have done for the Road to Worlds Series these past few years, this one is easily my least deserving. Considering I had not played the game in ages, I really had no business winning a match, much less winning the Regional last weekend, and all of my opponents on Saturday are far better representatives of greater Minnesota Land's First Edition renaissance than I could ever hope to be. I was just a party crasher, and having denied stat-crunching James Heaney, glossary-wielding Matt Hayes, or deck-lending Dan Van Kampen the inaugural Committee-era title is a bit surreal. James: I noticed you hadn't played Constructed First Edition in quite a while now. What made you want to play in this week's Regional? Kris: Rather ironically, it was a perfect storm of several factors, most notably this weekend's weather. As my tournament report readers and Big Kev's blog followers already know, this year the Upper Midwest has been hit with a never ending winter, and with a forecast calling for a rain / snow mix and 40ish degree temperatures on Saturday, my plan to get started working in the yard went up in smoke. Coincidentally, I was also hoping to meet up with my step mother for an early Mother's Day gathering over the weekend, and since she lives right near the Regional's venue I figured killing a few water soaked hours with the First Edition Boyz afterwards was a decent alternative. James: Can you remember what you played in your last First Edition constructed tournament? Kris: 'Course I can; my last First Edition constructed gig was at Worlds 2002, where The Big Goodbye running-mate Nat Kirton and I con-chair-to'd a Borg battle concoction. My memory is a bit hazy, but if I recall correctly it revolved around the pre-errata Bajoran Resistance Cell objective to give all of the drones the skill of Resistance, turned a bunch of card draws into downloads, and obliterated the opponent with Gowron of Borg, Nine of Seventeen, a Queen's Borg Cube, and Maximum Firepower. In fact, it put me into the Sweet 16 that year where I was promptly greeted by a nightmare opening pairing against Lee Clarke’s alternative Borg design that caught me sans Prefix Code Transmission (by the way, taking it out of my Q's Tent was great advice Hoffman! ), and it all went downhill from there. James: Had you kept up with the First Edition rules and cards, or was it like a new game to you? Kris: It was basically a new game. I've revisited the First Edition glory days from time to time by hosting local OTSD sealed events and jumping into online sealed gigs put on by the Mission to Talos IV folks. Apart from maybe clicking on a cool Card of the Day image here or there I was effectively starting over. But as James Heaney notes in his tournament report, despite being brutally honest about my decade plus knowledge gap, most of the fellas knew their history and didn't buy the whole "how do you play this game?" angle I was working. I guess they knew better than to trust a guy with Treachery x2! James: It sounds like you turned up, were given a deck, had a few minutes to learn how it works and were then thrown into games straight away. Does that sum your experience up? Kris: Yeah, that's pretty much how it went. After checking the weather report for the weekend last Thursday, I made the decision to audible to playing in Starcade and thus sent out a wave of text messages to the participants soliciting an easy to play design I could borrow. As I have been working towards the play Klingon ten times achievement of late, and I knew the affiliation would allow me to return to my battle roots, Dan Van Kampen's tournament winning TNG Block design fit like a glove. Once he kicked me the deck list, I spent maybe 20 minutes reading over the cards and firing questions at him to make sure I understood the mechanic correctly, but apart from that I didn't do any homework on what others might play, current rulings, the OTF ban list, etc. as I was really just making an appearance to hang out with old friends, share a few war stories, and scoop up some achievements. James: Can you describe how the deck works? Kris: Umm... sure...??? 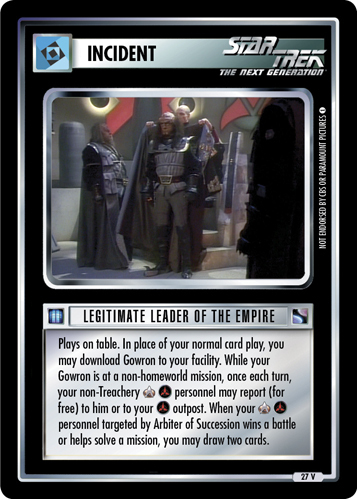 As far as I can tell, it's a pretty straight forward TNG Block design centered on Legitimate Leader of the Empire to barf personnel directly to googley-eyed Gowron. Attention All Hands and Continuing Mission provide a speed boost with free reports and draws, and Officer Exchange Program can convert some of those draws into the dial-a-dude option if you are short on skills for missions or dilemmas. Apart from that, Dan Van Kampen had indicated the intent was to NOT blow people up, and instead use I.K.C. Pagh to harass the opponent and score bonus points, but I felt that was just crazy talk; you can't wave a steak in front of a hungry dog and not expect to get bit! Kris: If there are, I'm too dense to notice them. The only combo I pulled off of note during the event was firing with a Maximum Firepower from a ship carrying Ablative Armor, but that's nothing new; it's a trick I remember employing on more than one occasion back in the day. James: What was your dilemma strategy? Kris: Having only a basic understanding of what Dan's dilemmas were supposed to do, I seeded the two Birth of "Junior" combos on the opposite ends of the space line, threw Dead End under whichever mission seemed the most likely to lead to in-game shenanigans (Homeworlds, high-point planets, etc.) and more or less mixed and matched from there. While far from perfect, this unorthodox approach often left opponents muttering to themselves about what they would soon face and preparing for dilemmas I didn't even know existed, so I must have done something right. James: What did you learn about your deck from your first game against James Heaney? Kris: First and foremost, that Dan's design didn't have the ability to attempt Qo'noS, which monkey wrenched my options from the opening bell. While the free reports and draws flowed early, mid-game they dried up, which became a recurring issue as the tournament progressed. My neophyte opinion is that there are probably a couple cards in there that could be swapped out for more card drawing free reports (e.g. Tactical Console, Council of Warriors, etc. ), if any exist, though I'll leave any potential revisions to the creator. However, the build proved pretty efficient at taking on a wartime posture, harkening back to my former First Edition strengths, and a few timely ship battles later I didn't need to be a First Edition wonk to sense that the wheels on his wagon were getting wobbly. In essence, these momentum changing turns pushed what I've found to be a universal game theory truth to the forefront; against superior opposition your best chance of success is to force your opponent into an alternative win scenario and to take bold actions that defy the standard operating procedures. Basically, I backed him into a corner where he would be required to beat me with Plan B, C, or D, all while gambling with my own mission attempts. And, somehow, that preposterous plan actually worked! James: Your game against Matt Hayes sounds like it was decided by the free play engines. Yours working to full effect, while Matt's stalled. Would that be accurate? Kris: Taking nothing away from my long-time rival, yet constant ally, Matt Hayes; but before our match began I had the premonition that, somehow, someway, I would find a way to win. As a result of this gut feeling and the confidence I had built up with my prior round upset of James, I approached the game with what can only be classified as an otherworldly tranquil demeanor. I guess you could say that having already picked up one win I shouldn't have, I effectively felt like I was playing with the house's money at that point, ya know? Given that hunch and considering that I had nothing to lose and everything to gain, as arrogant as it sounds (though it is honestly entirely unintentional) the deck firing on all cylinders seemed automatic, and the success rate of my sealed-esque approach to mission attempting was unsurprising. In reading Matt's tournament report, it appears as though many of his gimmicks failed to deliver, which likely contributed to the final result, but having little knowledge of what exactly was supposed to happen versus what actually did happen I can't really comment further. James: Your final game against Dan Van Kampen saw you up against a Borg all-space deck. Had you ever faced anything like that before? And, did you have a strategy for beating it? Kris: The Borg war machine Nat and I played in 2002 also seeded twelve universal Space missions, and while I knew Dan had a different spin on the affiliation, it wasn't completely unfamiliar. Having played next to him earlier in the day, I also learned it was an assimilator and I would likely have no place to hide, especially against the guy who designed the deck I was playing, so like my games against James and Matt I again decided to make him earn it as best I could by changing gears. Having glanced at his scorecard while we were shuffling, I also noted that his build seemed to be a Timed-Game Superstar TM, and quick math indicated that a modified win over me would still leave him short on victory points. That's not to say I stalled our game out more than you would expect from someone returning to First Edition after a decade long absence, but later on when I realized he needed me to keep playing personnel to fuel his own full win bid I instead elected not to and we simply coasted through solitaire mode as time expired. James: Does this victory mean we're likely to see you playing in more First Edition tournaments in the coming months? Kris: Ha! Doubtful, bud, very doubtful; like I mentioned in my tournament report this was a one night only return to the First Edition ring that started off as an achievement grab and ended as my second First Edition Regional victory, never mind the 15 year gap in between. Further, having sold off all of my First Edition cards a long time ago I would be ill-equipped to compete in anything other than the sealed or virtual formats without borrowing cards from potential opponents. And seeing how well that went for Dan Van Kampen this past weekend, I can't imagine any of the Minnesota guys falling into that trap again any time soon! James: So we should expect more surprise appearances then? Gotcha. Moving on, if you could create an achievement, what would it be? Kris: As a player who prides himself on being well-rounded, I would really like to see the tournament specific achievements expanded to include all of the formats currently supported by organized play. Specifically, it would be nice to acknowledge participation in a First Edition Draft, First Edition Warp Speed, Second Edition Academy, and Second Edition Slipstream tournaments, as achievements are pretty easy ways to encourage event diversity at the local level. Kris: Just that anyone wishing to repeat an out-of-nowhere winning performance such as this needs to heed my pal and prior 2013 Road to Worlds interviewee Nat Kirton's words of wisdom, which incidentally are often reiterated during games of Second Edition that he is losing; "You gotta risk it to get the biscuit!" Thanks to Kris for answering these questions. Now get back to work on your week 7 predictions! Please Note: The tournament system incorrectly awarded a second bye at this Regional. It has since been rescinded. These bye winners have been added to the list of current bye winners for the Continental Championships and the World Championships here. For everyone who didn't win a bye, there are still 48 Regionals where you can earn one. There were twelve players at two First Edition tournaments this week, taking the total players at First Edition Regional Championships to 50 - an average of 7.1 players per tournament. 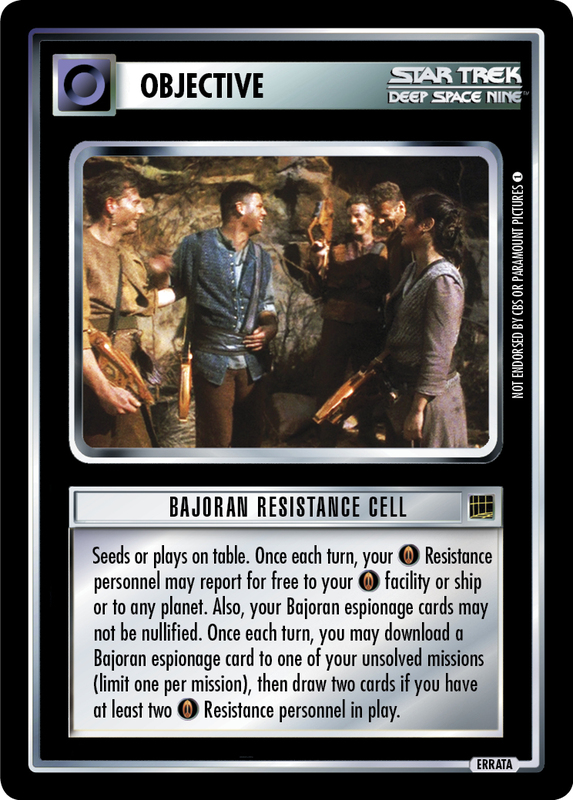 The best performing First Edition affiliations to date are Bajoran, averaging 12.0 victory points per tournament; followed by Ferengi, averaging 11.0 victory points; and then Vidiian, averaging 10.8 victory points. The worst performing affiliations to date are Dominion, averaging 9.0 victory points per tournament; followed by Hirogen, averaging 8.7 victory points; and then Federation averaging 8.3 victory points. There were ten players at one Second Edition tournament this week, taking the total players at Second Edition Regional Championships to 135 - an average of 9.0 players per tournament. The best performing Second Edition affiliations to date are Deep Space 9, averaging 16.5 victory points per tournament; followed by Maquis, averaging 14.3 victory points; and then Relativity, averaging 13.5 victory points. The worst performing affiliations are Romulan and Terok Nor, both averaging 10.7 victory points per tournament; followed by Next Generation, averaging 10.5 victory points. There were eight players at one Tribbles tournament this week, bringing the total players at Tribbles Regional Championships to 81 - an average of 8.1 players per tournament. Excluding preliminary heats, a total of 23,526,255 Tribbles have been scored to date, an average of 290,448 Tribbles per player. Edit (June 5th): These statistics have been updated following the delayed First Edition result from Australia. Kris and Johannes both correctly predicted the winner, so the following paragraph is no longer true. It remains for posterity. In what may be a first, none of last week's winner predictions were correct. Interviewee Johannes Klarhauser (Kaiser) did predict that he would take last place in the interviewee's table though, and he was 100% correct about that. In a worrying trend, each week's interviewee is getting increasingly worse at predicting the results. As they have now hit rock bottom in week 5, we shouldn't expect too much (or, anything...) from future interviewees. This week, Matthew Frid (bandana8472) is stepping in to predict for interviewee Kris Sonsteby (LORE). Arby's Restaurant: This will be the sixth year that this Second Edition Risa Regional has been held in San Diego, California. Based on the ratings, this looks to be a two-horse race between Nathan Wineinger (Naetor) and Johnny Holeva (jjh). In head-to-head matchups, they have identical winning records against the other. When it comes to tournament wins, Johnny is victorious in 43% of tournaments he enters, as opposed to Nathan's record of 37% wins. Recently, Nathan has the better record with two wins and a second place from three tournaments this year, while Johnny has two wins and a second place from six tournaments this year. The last time they met, Johnny was victorious over Nathan and caused his only second place of the year. The outside bets, to continue the horse racing analogy, look to be the Section 31 hosts Dan Hamman (SirDan) and Rogue Shindler (SirRogue). Dan was victorious at this Regional two years ago, but hasn't won a tournament since, so he must be due a win soon; while Rogue has the form with a win and a second place to his name from his last two tournaments. For my prediction, I'm not going to play the odds. Nathan to win. Kris: Nate Wineinger to win. Why? Despite being jobbed outta two Regional titles last year by The California Committee, The Alabama Slamma rose to the occasion a few months back at Nationals in San Pedro and is the only combatant with a winning record against everyone he's likely to face. Presuming winter vacation hasn't left him rusty, I'm certain he will prove this brain thing of mine isn't just a gimmick. Matthew: Looking down the barrel of the much-lauded Risa regional, I see a handful of players pre-registered. All but the 1600-level players are currently represented. If Nate had stayed true to his "printable" roots, I would've picked him to win. However, I'm going with Johnny Holeva. He's a local legend who's played since the beginning of Second Edition. The California Committee will not let you down, people. 2012, won by Johnny Holeva (jjh) playing Borg. 2011, won by Dan Hamman (SirDan) playing Equinox. 2010, won by Johnny Holeva (jjh) playing Cardassian / Ferengi. 2009, won by Johnny Holeva (jjh) playing Borg. 2008, won by Johnny Holeva (jjh) playing Borg. Week 7 of the Road to Worlds sees this weekend's single Regional reviewed, an interview with the winning player, more statistics, and regular service resumed with a preview of next weekend's nine Regionals.